Wash and dry spinach. Peel onions and dice. Heat some oil in a frying pan set over medium-high heat, add spinach and onion and sauté briefly. Season with salt, pepper, and nutmeg to taste. Remove from pan, add to a bowl, and let cool. Crumble feta into the bowl and fold in the spinach. Pre-heat oven to 180°C/350°F. Wash endive and quarter. Transfer endive and tomatoes onto a baking sheet, drizzle with some olive oil, and season with salt, pepper, and sugar to taste. Roast in oven for approx. 8 – 10 min. Wash chicken breast and dry with a paper towel. Cut an incision lengthwise and stuff with spinach-feta-mixture. Heat some vegetable oil in another frying pan set over medium-high heat and sear stuffed chicken from both sides for approx. 2 min. Reduce heat and let simmer for approx. 5 – 8 min. until cooked through. Wash lamb’s lettuce. 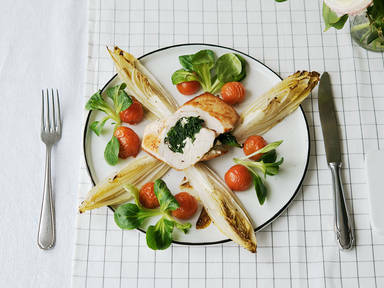 Serve stuffed chicken breast with roasted endive and, tomatoes and lamb’s lettuce. Enjoy!